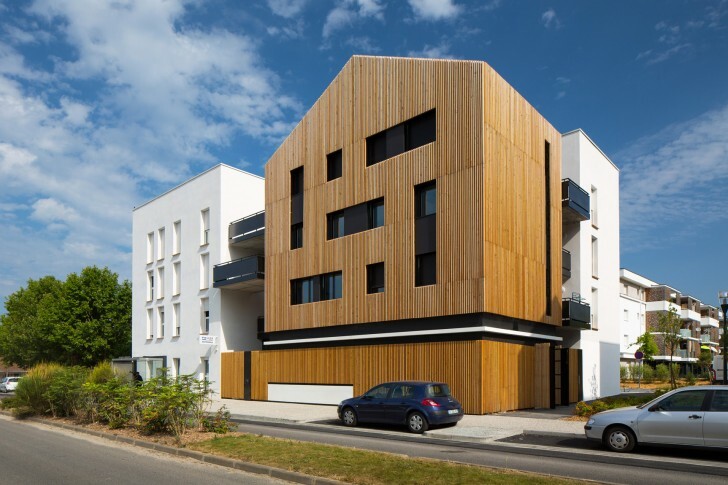 Paris-based architectural studio Marjan Hessamfar and Joe Vérons Architectes completed work on the elegant Aquitanis Community Housing Complex in Floirac, France. The clean lines and contemporary look of the complex, which includes 36 apartments and various community areas, make it an attractive benchmark for the area undergoing a major urban renewal initiative. The Aquitanis complex distributes 36 apartments over the top three floors, each singularly spaced around an open communal patio. The design strategically placed separate but interconnecting blocks throughout, which allows for several outdoor communal areas. Additionally, the architects decided to forgo one large entry way so that each block has its own entrance, giving residents more privacy and a sense of ownership. The layouts of the individual apartments vary in size, ranging from two to four bedrooms. Residents share a large community area on the bottom floor, which along with the residential Aquitanis office, is comprised of two store fronts, a police station and private office space. 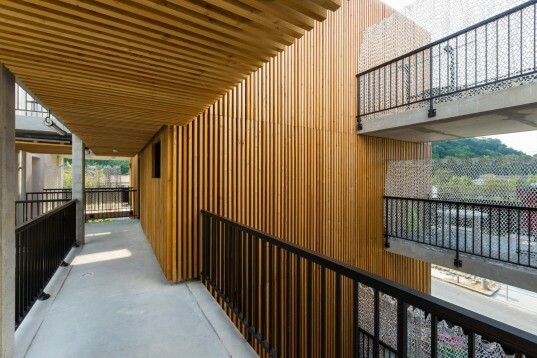 As part of the project’s ambitious energy-efficiency plan (French THPE: very high energy efficiency), the architects wanted all residents to have the ability to take advantage of natural light all year long. Therefore, a multi-layered design was chosen to ensure that different rooms in each apartment has access to the optimum amount of sunlight during the day. Although there are various communal outdoor areas inside the complex, each apartment also has an individual terrace that tenants are free to customise as they wish. In order to integrate the Aquitanis residences with the surrounding neighborhood, the architects focused on creating an aesthetically pleasing community that emits a welcoming and healthy atmosphere. Accordingly, the landscaping around the project was seen as an integral part of the entire building process. The area was sculpted with a number of densely planted green areas and more green spaces will be planted in the future. For easy access, the complex is connected with its surroundings by linking pedestrian and cycle routes and various walkways. The Aquitanis complex distributes 36 apartments over the top three floors, each singularly spaced around open communal spaces and spacious walkways. The design strategically placed separate but interconnecting blocks throughout, which allows for several outdoor communal areas. Residents share a large community area on the bottom floor, which along with the residential Aquitanis office, is comprised of two store fronts, a police station and private office space. As part of the project's energy-efficiency plan, the architects wanted all residents to have the ability to take advantage of natural light all year long. A multi-layered design ensures that different rooms in each apartment is able to enjoy the optimum amount of sunlight during the day. Although there are various communal outdoor areas inside the complex, each apartment also has an individual terrace that tenants are free to customise as they wish.